233 customers have given this product a 5-star rating. 52 customers have given this product a 4-star rating. This contacts spray is a lifesaver. The can comes packaged in a sealed thick plastic bag, very smart in case the can happened to leak in transit. The can comes with an attachment to get into small tight areas like pots/switches/faders which is very handy. 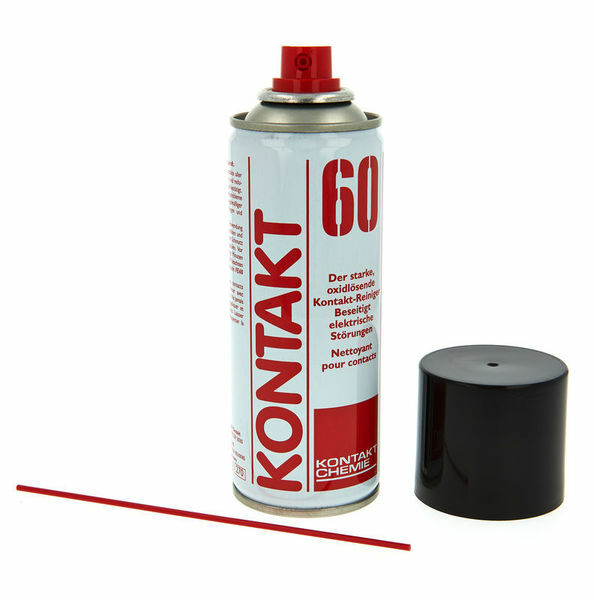 The product works extremely well, I have a bass which has had a scratchy volume pot for over 10 years which was getting consistently worse, rather than change the pot I decided I would try and clean it first, after 3 or 4 squirts of kontakt and some turning of the pot it is now like new. I will be purchasing more of this product soon so I always have some on standby. Simple et efficace. J'ai pu redonner une seconde vie à une basse des années 80 (potards crachouillant) et surtout à ma Roland TR606 (boites à rythmes mythiques des années 80). Pulvériser et attendre 10 à 15 minutes et le tour est joué. Pour la TR606, j'ai quand même du m'y reprendre à 2 fois, mais le résultat a dépassé mes espérances. Très content. ID: 324235 © 1996–2019 Thomann GmbH Thomann loves you, because you rock!